Yeah… I guess it was pretty big. The food was in full effect! 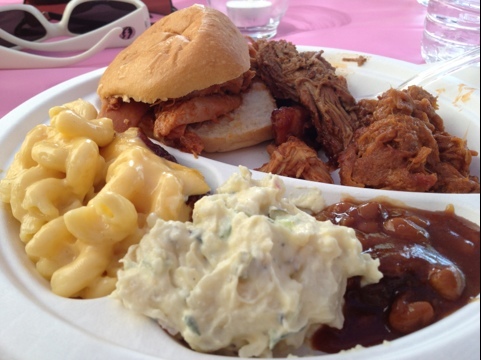 Pulled pork, pulled chicken, mac n’ cheese, potato salad, and beans. The night before the BBQ, I went out with the groom and his buddies for a bachelor party. At one point in the night, the groom asks me if I’d ever heard of Copa Di Vino. When I told him I had not, he proceeded to tell me that the owner of the company was on the TV show, Shark Tank, pitching his idea to investors. Apparently, it’s a wine that comes in its own plastic cup. The idea is that it allows you to drink wine on the go without having to deal with the complications of a bottle. Copa Di Vino NV American Riesling and Copa Di Vino NV Columbia Valley Merlot. Each (Plastic) Cup of Wine is 187.5 ml. A standard bottle of wine is 750 ml. You can do the math, or just trust me when I tell you that each plastic cup is a quarter of a bottle (a pretty healthy pour). Online, you can buy a case (12 Cups of Wine) for $36. That breaks down to $3 a cup… or $12 a bottle. As far as the packaging goes, Copa Di Vino reminded me a lot of a cup of yogurt. Remove the plastic lid, peel back the aluminum seal, and it’s go time! Let’s get into the wine! Nose: In retrospect, I should have poured my Cup of Wine into a glass. Without having much of a lip to guide the aromas to my schnoz, it was tough to analyze. The nose to me was extremely tight, with hints of lemon mineral water. Palate: The palate lacked any sort of complexity to it. Really, it was kind of like water, with a squeeze of lemon and a drop of latte foam. I do give the Riesling props for not being sweet. I would have expected it to be overly sugarfied to appeal to the masses. Nose: A faint hint of buttered blackberry. Aside from the blackberry, the nose is almost Chardonnay-like. Taste: There’s that butter again. Look… I know that all red wine goes through malolactic fermentation, but usually (since there are so many other things going on) they’re not so in-your-face with the butter. There is still this blackberry fruit going on, but it’s unripe blackberry. There is a touch of black olive on the end. I guess the product speaks for itself. 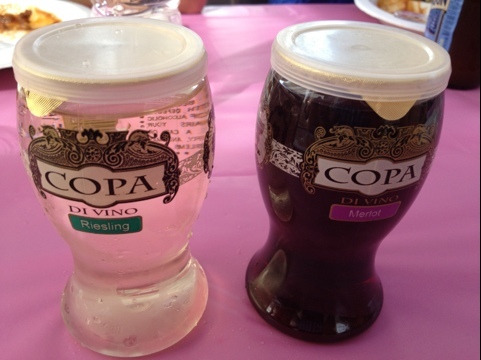 Apparently, the investors on Shark Tank passed on the Copa Di Vino. Based on the price, and the quality of the juice, you should too. I guess that’s what you get when you spend more time dreaming up the cup you’re serving your wine in than you do the wine you’re serving in the cup. 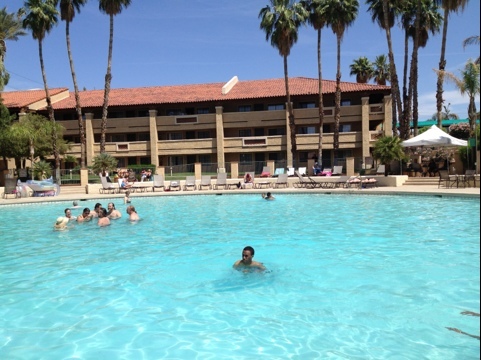 This entry was posted on May 22, 2012 at 9:21 am and is filed under Uncategorized. You can follow any responses to this entry through the RSS 2.0 feed. You can leave a response, or trackback from your own site. Hey Dude, Stayrad comes up fourth in search results for copa di vino. Good job. How does this Merlot compare to Chucky? There are 2 things I immediately thought when I saw the package, pimp cup and no swirl room. I guess the swirl room isn’t needed given the juice. Enjoyed the post a lot more than I think you enjoyed the wine.